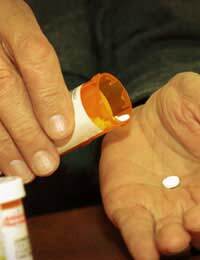 NSAIDs or non-steroidal anti-inflammatory drugs are frequently taken for back pain. They are relatively cheap, very accessible to buy, safe if used correctly and come in many strengths and forms. Unlike narcotics, NSAIDs are non-addictive, do not interfere with respiratory function and do not induce a sedative effect. As the name suggests they do not contain any steroidal agents and the most common forms of NSAID are aspirin and ibuprofen. Paracetamol, although often grouped in this category, is not seen by everyone as a true NSAID as its anti-inflammatory properties are low. NSAIDs are very useful in reducing swelling, inflammation, pain and temperature. They work by interfering with the chemical chains of reaction within the body. NSAIDs are very widely used in both acute and chronic back pain, though prolonged use is not recommended due to the possibility of gastric irritancies. Most back pain is accompanied by, or due to, inflammation; these drugs can be taken purely for their anti-inflammatory effects. Typical conditions that can be helped by the use of NSAIDs are rheumatoid arthritis, osteoarthritis, period pain, headache, metastatic bone pain, post-operative pain, ankylosing spondylitis and fever. Aspirin is also widely used in the treatment of some blood disorders as it helps to prevent blood thickening and clotting.Ibuprofen is particularly effective is the treatment of lower back pain and ligament, muscle and tendon pain in the cervical spine region. Most users should take the lowest dose for back pain and for the shortest time to reduce the risks of any side-effects, though NSAIDs should be taken on a regular regime, as directed, in order to experience the maximum anti-inflammatory benefits. The duration of the regime should not exceed three weeks. NSAIDs are not recommended in pregnancy, with the exception of paracetamol and aspirin which may be taken under medical supervision. As these drugs are metabolised in the liver and excreted through the kidneys, medical advice should be sought in the presence of liver or kidney diseases and disorders. Aspirin should be taken with caution if other medications are being taken for blood or cardiovascular conditions.As many other preparations, such as cold and flu remedies contain paracetamol, all labels should be read thoroughly and taken only as directed to avoid accidental overdose. In the event of an overdose, even if only a minor one, medical advice should be sought, as liver impairment can occur.Reported side-effects, particularly of prolonged use of NSAIDs, include heartburn, stomach upsets and nausea. To try and avoid these occurring, take medications with food and plenty of water. Although rare, if there are any signs of an allergic reaction, such as swelling of the face or airway or difficulty in breathing, seek medical attention immediately and where possible, take the container of the drug with you to the hospital. Non steroidal anti-inflammatory drugs are relatively safe for back pain, and for most people, the risks of taking it are minimal. They are effective at both reducing swelling and as an analgesic. They can be bought without prescription, but should not be taken for excessive periods of time. Always read the label and follow directions carefully.